At Ancient Faith Publishing, we LOVE creating books for kids! It is our belief that the books we make for children are just as important as the books we make for adults. In fact, since kids are under our care and guidance, since children are gifts given to us—whom we should teach and love and nurture–our work for them better be good. Children’s picture books are the most time consuming and expensive of all of our products to create. Here’s what goes into the process so you can see our love for kids in action! 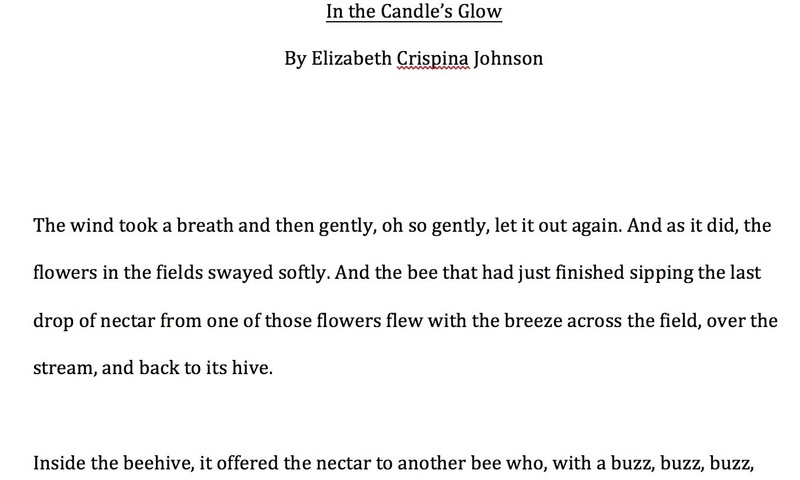 Elizabeth Johnson is one of the finest Orthodox children’s authors that I know. She’s witty, creative, disciplined, professional, and easy to work with. 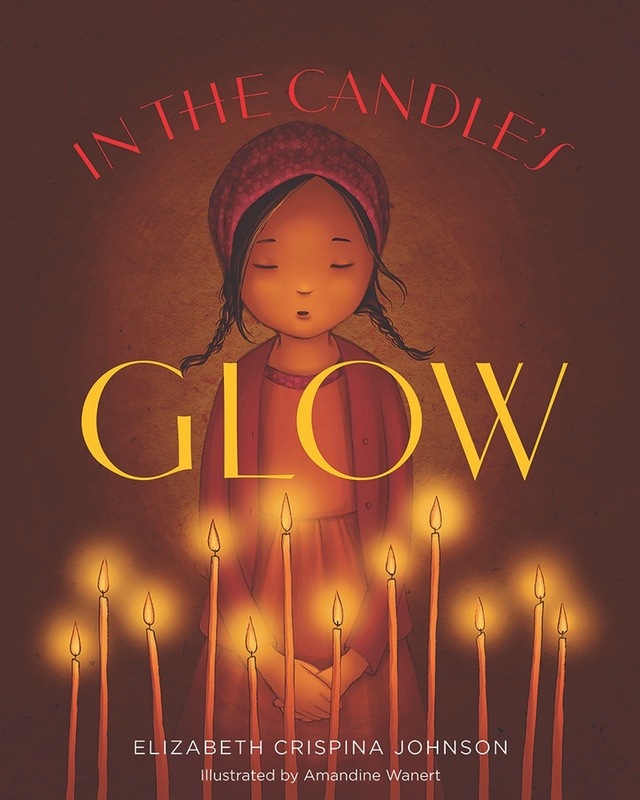 In the Candle’s Glow was a story that we had looked at and liked, then set aside as we worked on other projects. We eventually rediscovered the story and placed it in our queue. We started working on it about 18 months before it was published and available for purchase. This is one of the hardest parts of my job. 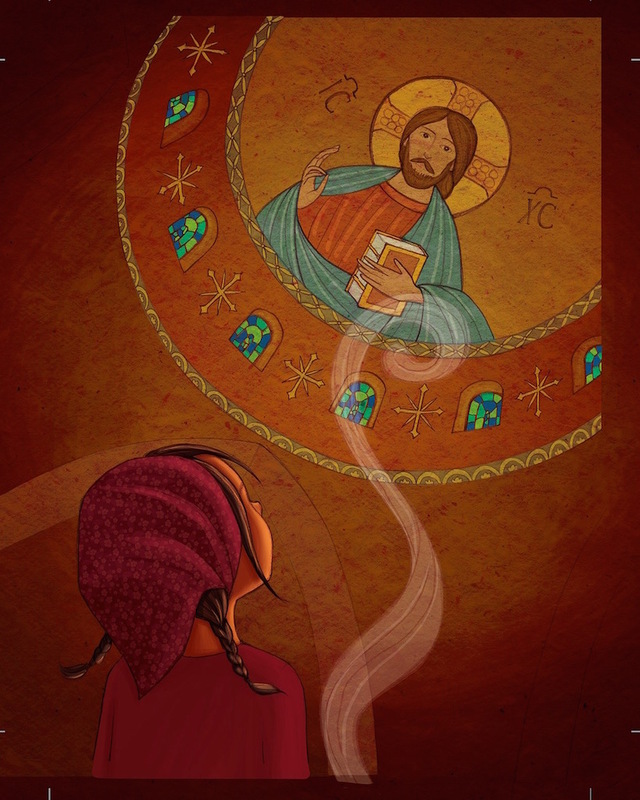 Professional illustrators do not often happen to be Orthodox Christians. And because we produce so few books in the grand scheme of a very large book market, it is difficult to pay an artist a competitive sum for their amazing work. We work very hard to be fair—to treat our artists with the utmost respect—and to compensate them as best we can. Matt Dorning, our fabulous art director, was doing a little research in a Catholic bookstore near where he lives. He wrote down the names of several books that he found there on the shelves, and especially noted the names of the illustrators. 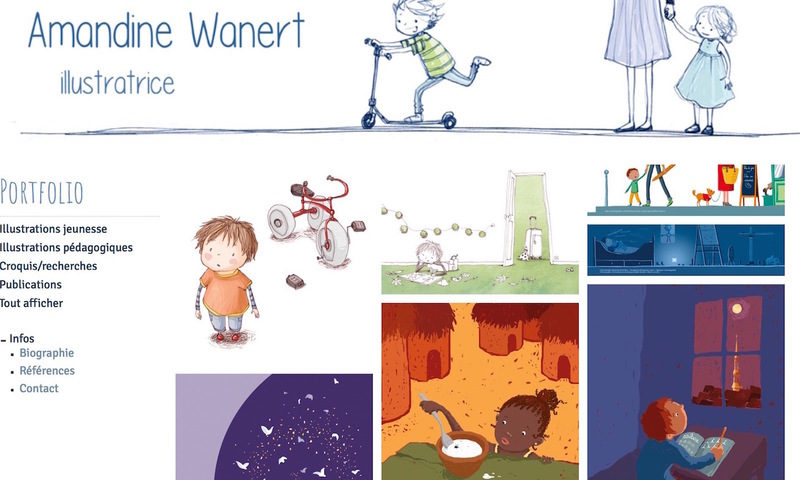 One was Amandine Wanert, a medical illustrator based in Paris. I contacted her to gauge her interest for In the Candle’s Glow. She immediately liked the story. Our deadlines fit within her schedule, so I had her submit a few samples to see if the style worked for us. One thing led to another, and we offered her the contract and got started! While the contract with the illustrator was being finalized, I darted back to the author to get the text in order. 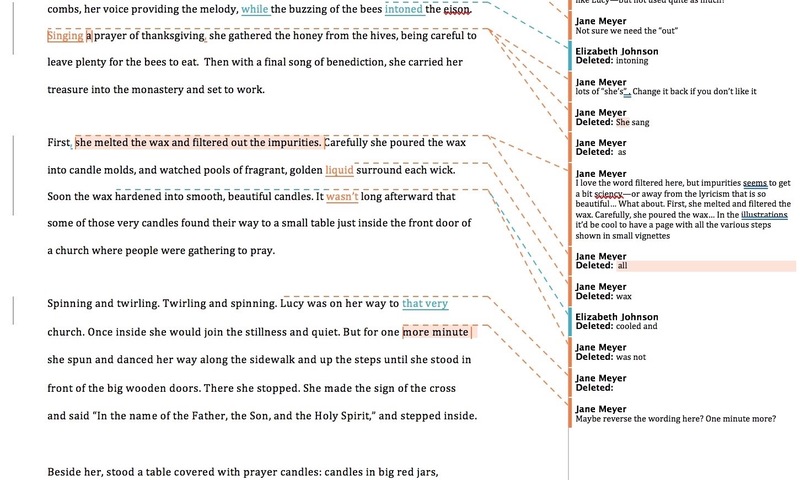 Elizabeth and I went through a couple of rounds of edits (she is easy to edit! 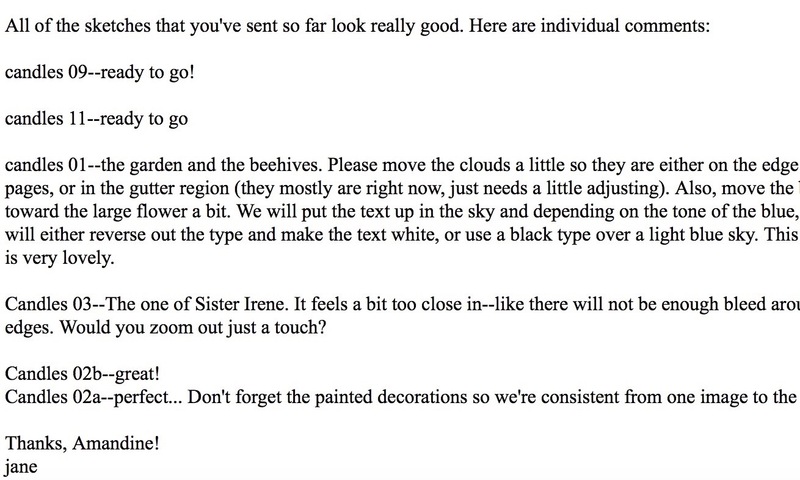 ), and we then sent the text to Katherine Hyde, our editor of adult books, who also copy-edits all of our children’s manuscripts. Matt and I then had a long-distance phone meeting with Amandine, brainstorming ideas of style and images, and we answered any questions she had. 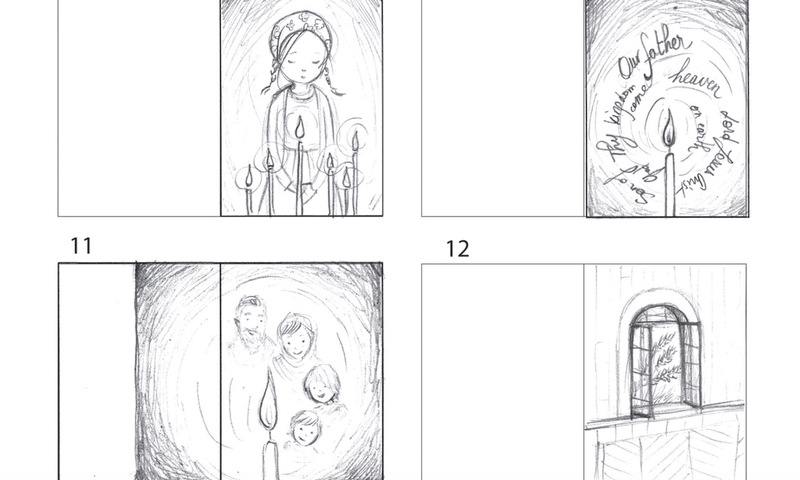 We like to give as much freedom as possible to the illustrator in these beginning days of creating the book, so that we can maximize the artist’s creativity, allowing them to interpret the text with their unique viewpoint. Amandine then started sketching. 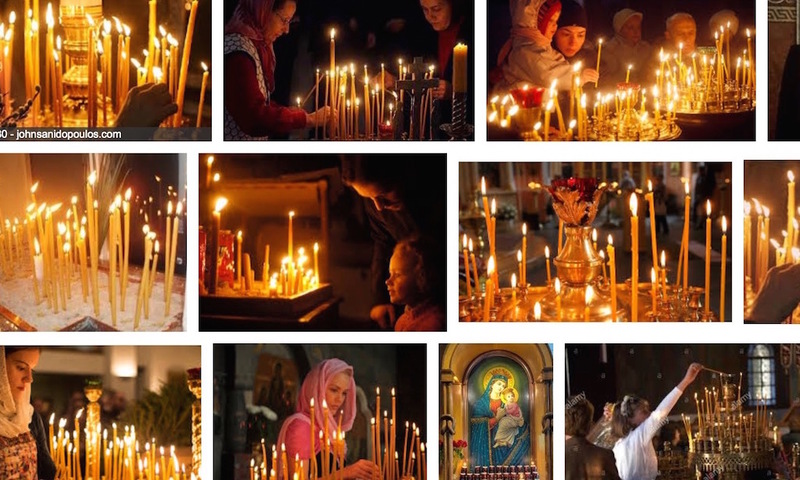 She isn’t an Orthodox Christian, so we sent her all around Paris to sit in Orthodox churches, soak up the atmosphere, take photos, talk to people, and generally be in the sort of space that we wanted conveyed in the book. While Amandine was visiting churches, Matt and I did research on country churches, on beeswax candle boxes, and Elizabeth joined us in our search for images of beekeeping tools and other items that might be interesting for the illustrator to consider. We sent dozens of images to Amandine. 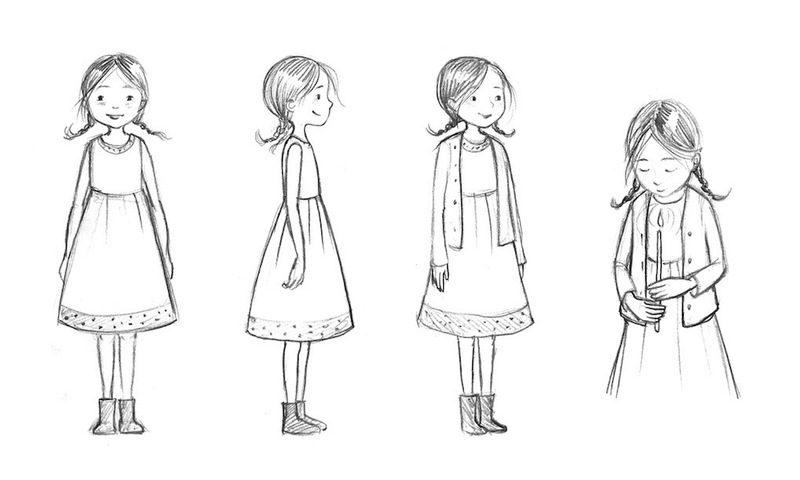 Amandine did sketches of the characters, especially the little girl (who is modeled after Elizabeth’s granddaughter). Then followed the individual sketches with a story board. Once the sketches were all approved, we moved one by one to the final, colored illustrations, and some of them we also modified mid-stream. Once the illustrations were finalized and placed in the book, there was a lot of detail work to attend to. The copyright page was finalized, we bought the bar code, checked to make sure we included the dedications, decided on what prayers and saints to feature at the back of the book and got permissions. Then we sent the book around to be proofed, and approved, and I triple checked the file, going through a long checklist of things to make sure all was in order. This whole process, from editing to sending the book to press, took over a year to complete. Our production manager, Kh. Carla Zell then zipped the book off to the Canadian press we chose. After that, we waited. And we worked on other things, and breathed, and eventually had a marketing meeting with Elizabeth to talk through the launch. Send it out into the World! In the Candle’s Glow came into our warehouse in Chicago a little before the expected date of February 8, 2017. Yay! We celebrated by thanking God that we’re able to do this fun work, and sent around some virtual high fives to the team. Then the very first books were shipped to the author and illustrator. On February 8th, we announced the book to the world, through our emails and other media, and lovely reviews started to flow in, once again reminding of us why we do this work—to inspire children in their faith, to spread the beauty of Christ and His Church. We hope you liked this insider tour of our work, and ask for your prayers as we continue on this road of serving our children in their faith! This is a fabulous post! 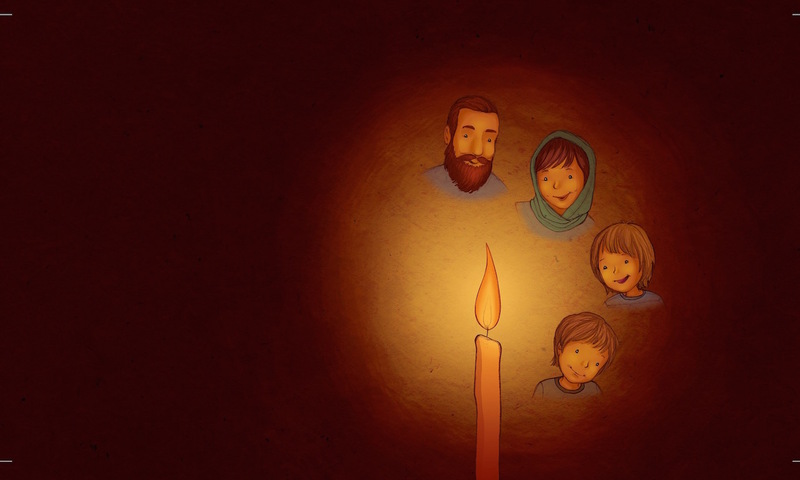 Thank you for this in-depth look at the process of creating “In the Candle’s Glow.” As an Orthodox mother and Sunday School teacher, I am overjoyed when I discover new, quality Orthodox Christian children’s books. I also work in the fine art world professionally , so I personally yearn for children’s books that are well designed and illustrated. I have absolutely been loving so many of the recent books Ancient Faith has published for children, aesthetically & content-wise. I very much look forward to reading “In the Candle’s Glow” soon! 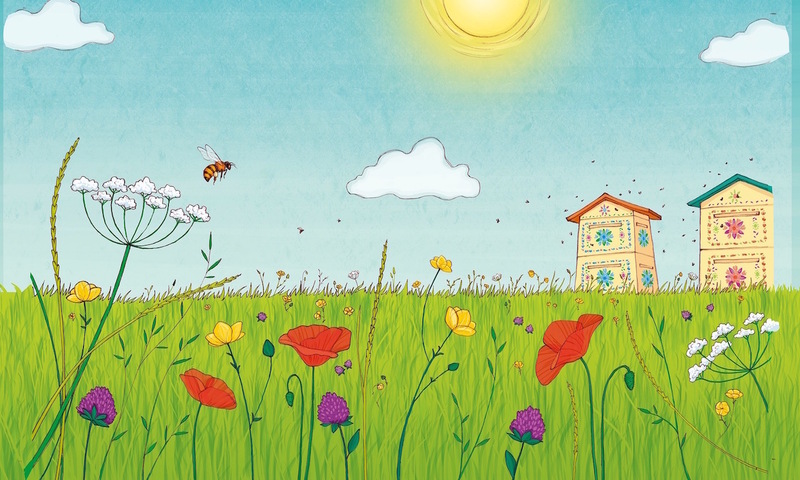 God Bless you all for your wonderful work creating books that inspire children (and parents!) to live Orthodoxy daily.